If you’re routinely putting up with unwanted daily deal emails in your inbox from websites you’ve long ago forgotten about, there’s a new service that will help you quickly and cleanly cut the cord. Read on to learn how to do away with unwanted emails once and for all. When daily deal websites first hit the Internet a few years ago, most people could not get enough daily deal news. 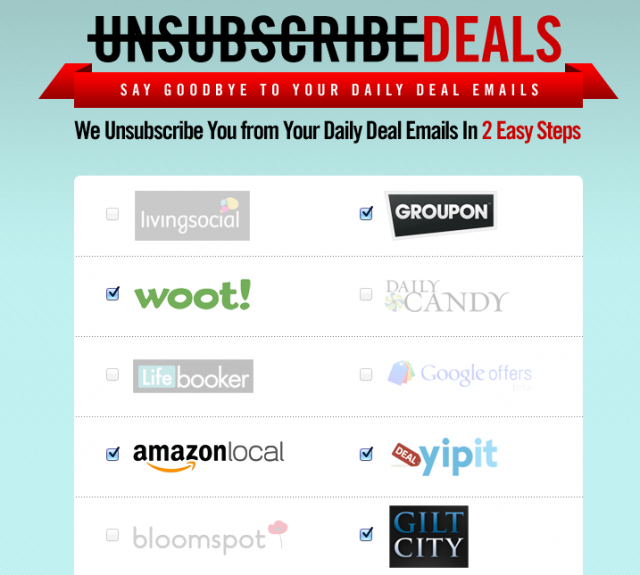 Users subscribed to any and every daily deal website online, often also signing up for daily deal newsletters by default. Fast forward a few months and the online daily deal shoppers were said to be suffering from daily deal fatigue. In other words, shoppers were being bombarded with email after email from websites they’d long since left behind. These days, many shoppers have moved away from traditional daily deal shopping and are now perusing the best of the best deals with daily deal aggregators. Even if you’re one of those who have moved on, you probably know from experience that that doesn’t mean those email subscriptions you signed up for eons ago are going to magically disappear. Sure, you can spend all day in your inbox and manually unsubscribe from every daily deal newsletter, but who has time for that? The UnsuscribeDeals.com service is 100% free and requires no additional action on your part.